It was a nail-biter, but Ohio State used pitching and its revamped defense to post an impressive win in the series opener in ‘Happy Valley’…1-0 over Penn State. State College, PA – Statistically, they say that less than 3% of all major league baseball games end in a 1-0 score. It’s even less in college baseball. 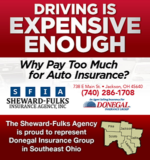 The Sheward-Fulks agency is proud to sponsor Buckeye baseball on Press Pros. But that’s exactly how the Ohio State Buckeyes won their 22nd game (22-10, 4-3 in Big Ten) of the season Friday over Penn State – 1-0 – on a combined 8-hit shutout that featured starter Connor Curlis (4.2 innings), Kyle Michalik (2/3rds of an inning), Thomas Waning (2/3rds of an inning), and the horse at the end, Seth Kinker, who pitched the final three innings (3 hits) to record his 8th save of the year. Kyle Michalik was credited with the win, his first of the year (1-1). “You don’t see many games like this,” said first baseman Conner Pohl, afterwards, during a massive Friday night fireworks show beyond the center field fence. And indeed you don’t – less than 3% at any level of baseball. That’s how good the pitching and defense – yes, defense – was in a game that took 3:01 to play. 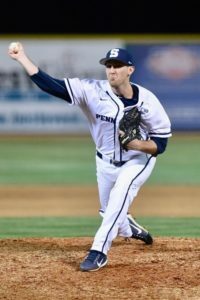 Pitching, by the way, by both teams, as PSU starter Justin Hagenman was tough as nails, taking a 4-hitter into the seventh inning, surrendering just one unearned run. The Nittany Lions bullpen kept it 1-0 with 2.2 innings of scoreless, 2-hit baseball by Marko Moricich and Mason Mellott. 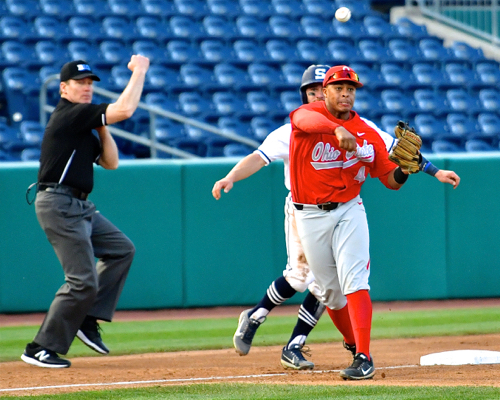 But as it turned out, the Buckeyes won it by being one run better, to gain their second consecutive shutout, and they protected that one run with some standout plays on defense. They finished the second and third innings with double plays and multiple men on base…and a running catch by center fielder Dillon Dingler to close out the fifth, Connor Curlis’s final inning. After the Bucks’ lefthander had loaded the bases with a hit batsman and a pair of walks, Greg Beals summoned Kyle Michalik from the bullpen to face PSU third baseman Connor Klemann. Michalik induced him to lift a fly ball to center that Dingler easily ran down for the final out. And inning later, he had an even better catch. Noah McGowan snuffed out a would-be Penn State rally with a sharp 5-3 double play to end the third. 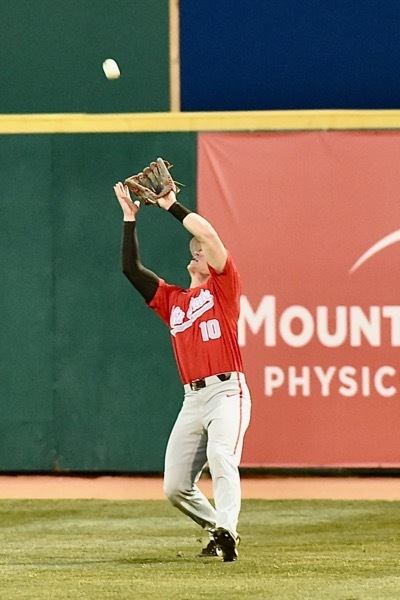 Waning surrendered a single to center by Curtis Robison to open the sixth, and Parker Hendershot reached first on the Buckeyes’ only error of the game – a tough high-hopper to third that handcuffed Noah McGowan. After a popup to McGowan for the second out, second baseman Joe Weisenseel sent a fly ball deep into the gap in right center that Dingler literally outran to catch for the final out. The only run of the game came unexpectedly, in the top of the fifth, when after two were out Dom Canzone singled, and Kobie Foppe was hit by a pitch. With runners on first and second, Hagenman attempted a pickoff of Foppe at first, but threw wildly down the right field line. Canzone scored all the way from first base for the Bucks’ only score, an unearned run. Shortstop Noah West cuts down PSU’s Braxton Giavedoni on a steal attempt in the fourth. The Buckeyes won it with 1 run on 6 hits and committed just one error. Uncharacteristically, only one man in the batting order, Conner Pohl, had a multiple hit night with a pair of singles. 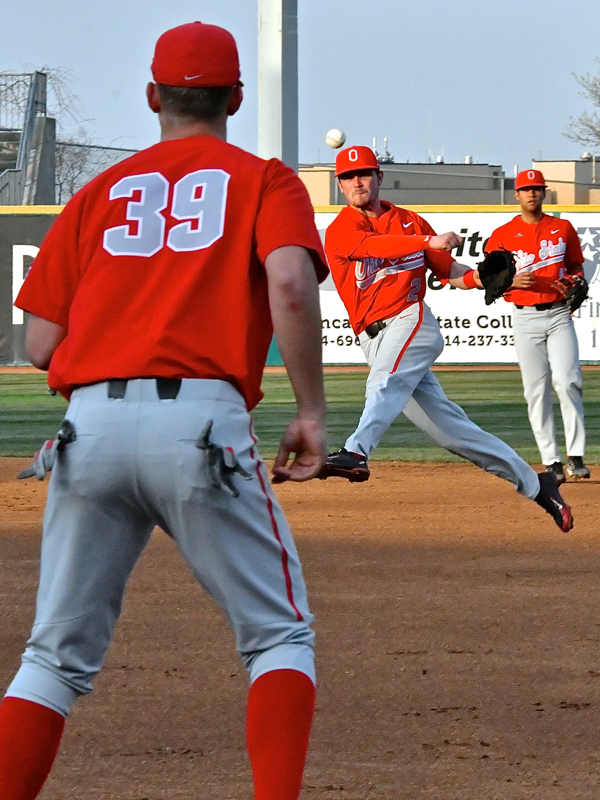 Uncharacteristically, there were only three extra base hits – a second inning double by Brady Cherry, an eighth inning double by Dillon Dingler, and a ninth inning triple by Kobie Foppe. They left the bases loaded twice, and left 13 men on base for the game. Penn State dropped their 20th game (7-20, 1-9 in Big Ten) with no runs on 8 hits, and committed two errors. The Nittany Lions left 11 men on base. Beals was obviously pleased with the manner in which they made that one run stand up. Freshman Dillon Dingler made a pair of catches in center to close innings and save runs. “Connor Curlis wasn’t sharp tonight, but you’re going to have about 14 starts a year and you’re going to be lights out for a couple, and not very good in a couple others. And the rest of them are going to be your normal stuff. He wasn’t as good as he normally is, but he got us into the fifth inning and that’s a tribute to his competitiveness. And as a tribute to Penn State’s competitiveness, they didn’t play like a 7-20 baseball team. PSU’s Justin Hagenman was tough as nails, taking a 4-hitter into the seventh inning. Out of concern for a return to uncertain weather on Sunday, the series will conclude on Saturday with a 2 pm double-header. Not ideal, because double-headers are hard to win, and the Buckeyes will undoubtedly look at the weekend series as an opportunity to sweep. Ryan Feltner (3-2, 5.11 era) and Adam Niemeyer (2-2, 5.06 era) will start for the Buckeyes, looking to improve their spot in the Big Ten standings with Indiana (25-6, and 5-2 in Big Ten) coming to Bill Davis Stadium next weekend. And if that figure is right, that less than 3% of baseball games are determined by a 1-0 score, it perhaps says something about Beals’ contention throughout the year…that while 22 wins are good, this team can get better. Back-to-back shutouts – pitching and defense – is powerful testimony. 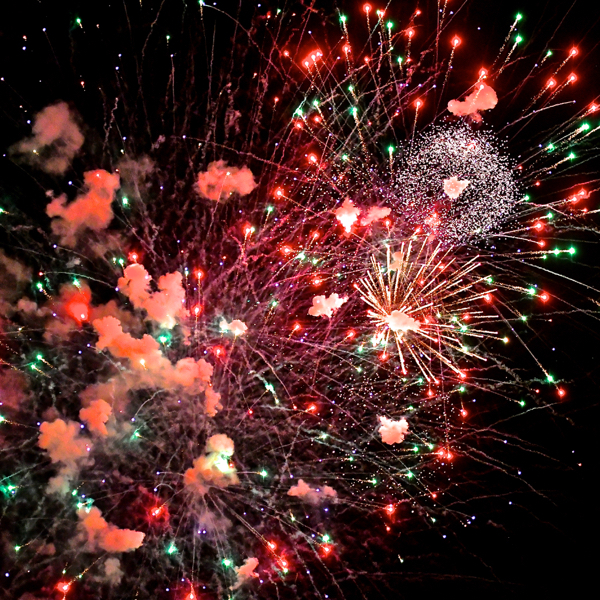 Lots of scarlet….symbolic of the Buckeyes’ 22nd win, the post-game fireworks featured a lot of red. United Building Materials is proud to sponsor coverage of Buckeyes baseball on Press Pros Magazine. com.